Nothing beats homemade cinnamon buns for sumptuous sensory overload. 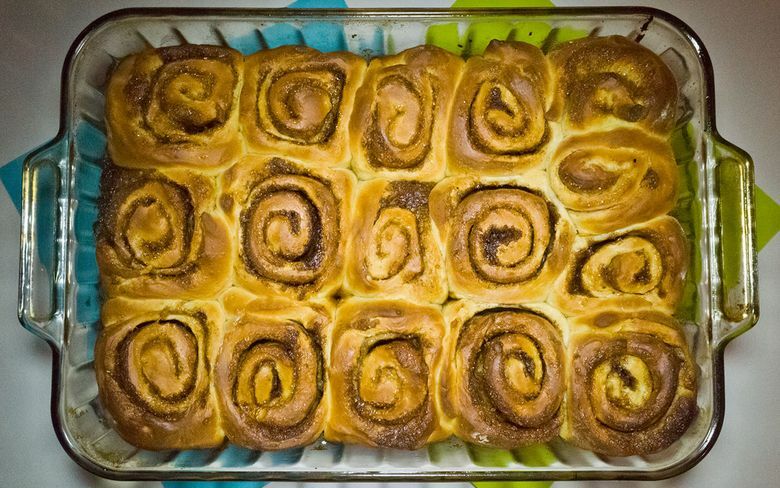 Cinnamon buns can come from a can or a mall kiosk, but the homemade buns are where it’s at. It’s a rich and puffy dough that gets brown and crispy but only in a delicate, bunlike fashion. The rest is all doughy goodness. They’re fluffy and pull apart with no effort, like the best desserts. This would be a good time to use fancy sugars, spices, and eggs and butter, since you’ll be tasting so much of that in the finished product. You also don’t have to use strictly cinnamon; adding other zippy spices to the mix like ginger, clove and cardamom make things more interesting. Copious amounts of butter and sugar and now THC are all supporting roles for some of the best buns around. To create the dough, mix in a stand mixer or bread machine until you have a very wet-looking blob. A bread machine will do the rising for you, but if you’re not taking that approach, dispense into a well-oiled bowl and cover with oiled plastic wrap, allow to rise for at least an hour. It should triple in size and now be a giant fluffy cloud of goodness. Plop the dough on a floured surface and roll into a sheet. Spread room-temperature butter over the sheet, then add all of your spices and sugar. Roll this sheet into a log, then cut it with a sharp or serrated knife into about 15 slices. Arrange the slices in a square metal or glass baking dish that has been generously greased, then allow to rise again for 45 minutes to an hour. Preheat your oven to 375 degrees when you’re two-thirds of the way through the second rise. Pop in your pan and bake for 15-20 minutes, keeping close watch. They will bake up rather quickly so if your oven runs hot drop the temperature to 350 degrees. Cool on a wire rack for at least 10 minutes before digging in. Now for the fun part: spices like cinnamon and cardamom can actually help you get more high from a single dose of THC. The same flavors in those spices are the terpenes that make a cannabis strain have different effects, like myrcene. Play with the ratios and you can change the effects, but it’s all still going to taste like that yummy cinnamon that makes firm memories every time you fill up the house with their delightful presence. Try sealing some up individually and freezing, then you can have a single serving, medicated breakfast anytime!